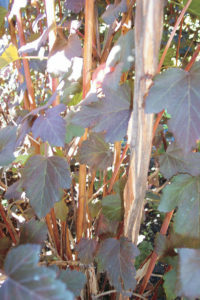 The long prairie winter has traditionally spurred the drive to develop woody landscaping plants that can add visual interest to the winter garden. 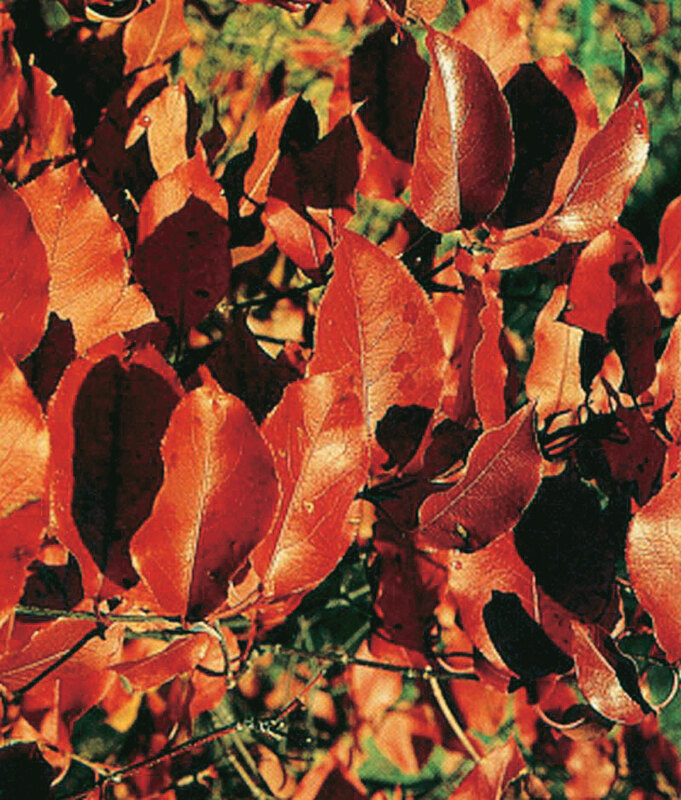 For deciduous, broad-leaved plants that are leafless from late September to the middle of May that special interest usually lies in the colour and/or texture of the bark. However, over-wintering fruiting characteristics may also add appeal. Coniferous evergreens are by far the main winter landscaping attraction because of their contrasting green, often grey-green, colour against the snow. My life centres on trees and plants, so it is natural for me to have favourite plants even in the winter. I am spoilt because I have travelled to many places in the world and so many of my favourites are found in other countries. I do have some winter favourites for the Prairies. This is my favourite Prairie tree. 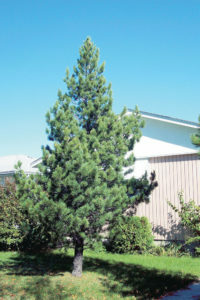 It is the only coniferous evergreen that is suitable for clay-loam soils on the Prairies. In general, evergreens do not generally grow well on Prairie clay-loams and suffer numerous diseases and pests as they grow older. Swiss stone pine, native to the mountains of central Europe and western Asia, is a rare exception. It is also rare in terms of consumers being able to purchase this tree. Sadly, for unknown reasons, Prairie growers have neglected this tree. 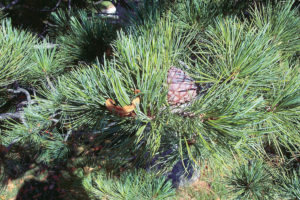 This is a very hardy “soft” pine in that the five needle clusters are soft and flexible like eastern white pine. 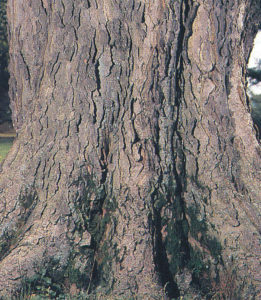 The tree has a broad, upright character with some specimens almost columnar looking. 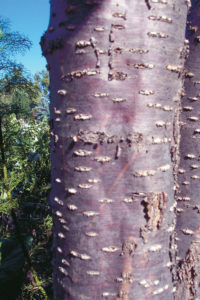 On some trees the winter bark takes on a distinct reddish-grey colour. In winter, besides its evergreen foliage, this tree has remarkable cones. The ovoid cone starts out greenish-violet in colour and then matures to a purplish-brown colour. Often the mature cones can be more reddish than purple. The seeds, often referred to as pine nuts, are edible. This is the only pine in Canada of which I am aware that has its new twigs covered with distinctly thick, orange-brown hairs. Swiss Stone pine and cones. I am very attracted to the soft peeling, sandalwood or cinnamon coloured bark of ninebark. 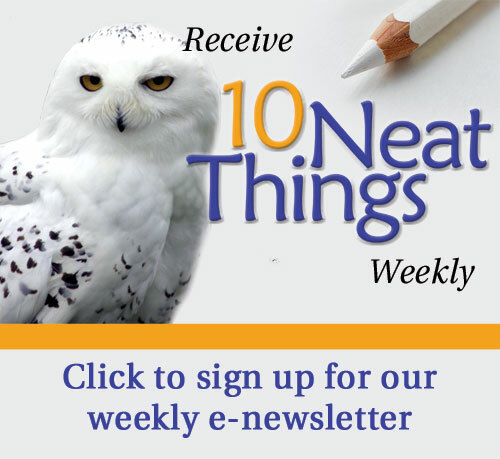 I have heard that the word “nine” in ninebark comes from “cinnamon”. The common ninebark is native to eastern North America, and it was one of my favourites when I lived in southern Ontario. The white flowers give way to unusual fruit consisting of attractive clusters of stocky red pods called follicles. 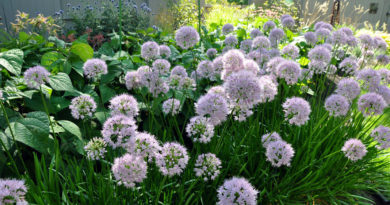 The plant is moderately drought tolerant, and needs full sunlight to flourish. Ninebark tolerates the clay loams of southern Manitoba, but it would prefer much better drained soils. The plant is sensitive to soils having a high alkalinity, which makes iron as a nutrient mostly unavailable to the leaves. 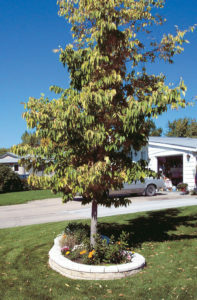 The resulting nutrient deficiency condition is called chlorosis, which causes leaves to go from green to green-yellow and ultimately to yellow-white. Prominent green veins usually appear against the yellowish background of the leaves. 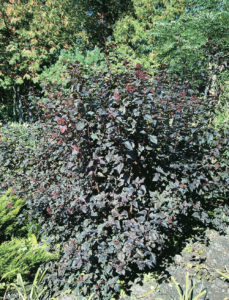 For summer time foliage, I like the shiny, purple-black leafed Diablo ninebark. The leaves require full sunlight to achieve that appearance. Diablo ninebark leaves and bark. This cherry is one of my three favourite deciduous Prairie trees, and I have two of them in my back yard. 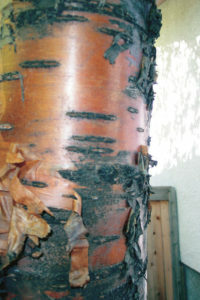 They do especially well in full sunlight, which in particular brings out the unique colour of the bark. The most notable winter feature is the slightly peeling, orange-bronze bark, which is somewhat similar to birch bark. I have never seen this tree infected with black knot fungus disease, which afflicts most chokecherries. The tree rarely produces a massive number of cherries; those that are produced seem to be quickly eaten by the birds. This is a great looking tree but a buyer should make sure their purchase does not have a sunscald crack down one side of the trunk. The crack will get larger with age, though amazingly most trees I have seen never seem to suffer as a result of it. This tree lilac is my second favourite Prairie deciduous tree. These trees make a prominent impact in the urban winter garden if they are grown without competition in full sunlight. A specimen tree will have a single straight trunk, its colour a smooth, lustrous, blackish-brown. Horizontal white lenticels (old breathing pores) pepper the bark of the trunk, giving it a cherry tree appearance. The summer flowers, or panicles, are creamy white and spectacular. 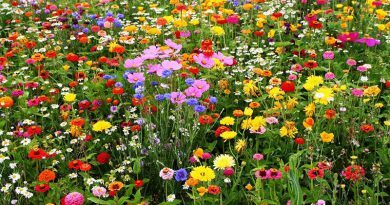 The flowers should be allowed to go to fruit, called capsules, which contain the seeds, and the capsules kept on the tree over winter. The winter capsules have a cinnamon colour and contrast well with the darkness of the trunk against a snowy garden landscape. Proper selection of this tree in the nursery or garden centre is important to insure specimen tree quality. 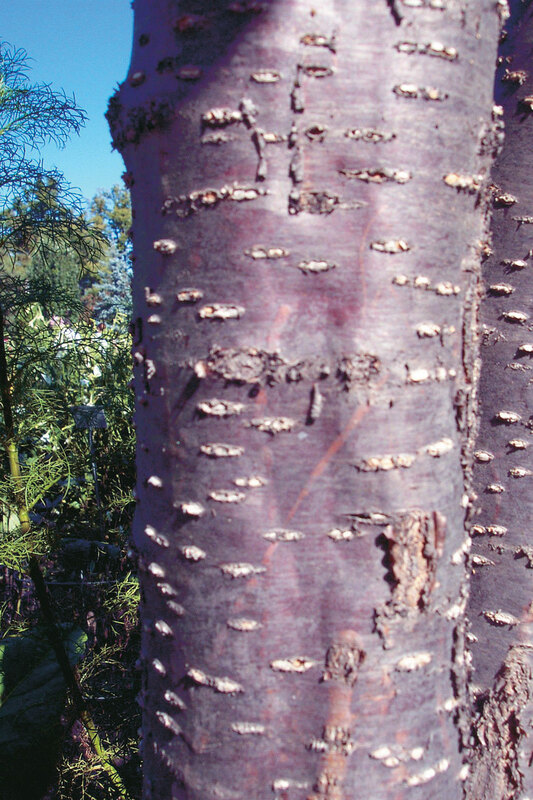 Never choose a multiple stemmed tree if you want true specimen quality; never choose a tree with sucker stubs showing at the base; and never select a tree with a frost or sunscald crack in the trunk. I especially like my third favourite deciduous tree because it is a geographic and genetic survivor of stock, which grows naturally in southwestern Ontario. 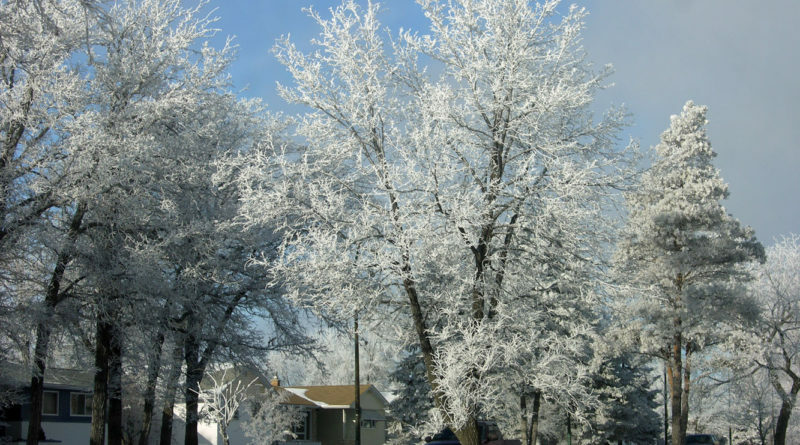 Hackberry is native also to southern Minnesota and south throughout the central and eastern United States. 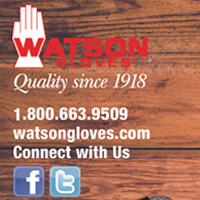 Hackberry trees have a light creamy-grey bark characterized by short ridges that are often referred to as warts. No other tree or woody shrub grown on the Prairies has these ridges. The fruit is a purple berry called a drupe, which can be sweet. 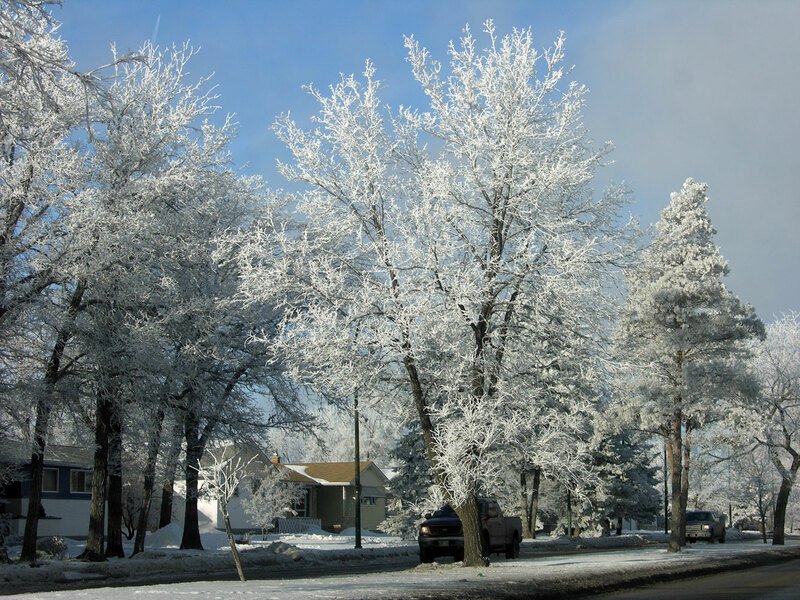 Hackberry trees are very hardy on the Prairies but if they are planted too close to busy streets, the de-icing salts cause the tree to produce closely spaced masses of misshapen branches and twigs called “witches brooms”. These brooms cause the branch structure to die back and can lead to the death of the tree. I have a strong affinity to woody plants in the genus Viburnum, a leaning that is reflected in my company’s name. I view nannyberry in its native aspen parkland habitat as the king of woody shrubs. Often it is a small tree growing up to 30 feet (nine metres) high. Of the native Manitoba viburnums, only nannyberry has a winter terminal bud. Lilac-pink, the bud produces the white flower clusters or umbels in the spring. The bud’s base is globe-like and tapers to a long point, which is the most distinguishing feature for identifying the species in winter. The shrub’s black berries are very attractive to songbirds, as are the fruit of all viburnums. Often the nannyberry plants are stripped of their fruit well before the end of winter. Nannyberries grow almost anywhere including shade, but they reach their full attractiveness in full sunlight. 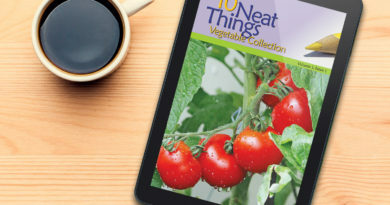 Their fall leaf colours can be a vibrant purple-red. These have been some of the plants I most enjoy in winter on the Prairies. As with all woody shrubs and trees, location and care spells the difference between having a high quality specimen or a sorry-looking plant. 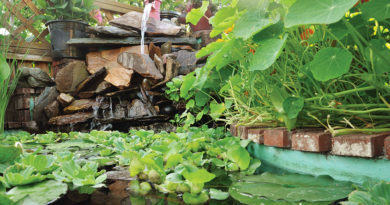 The number one problem in urban and acreage yards is crowding. For some reason, most people feel that trees and shrubs love to be placed close together. Not so. 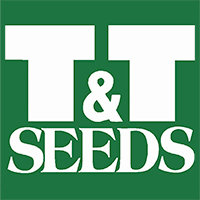 Over-crowding results in competitive growth stresses among woody plants, and also encourages pests and diseases. 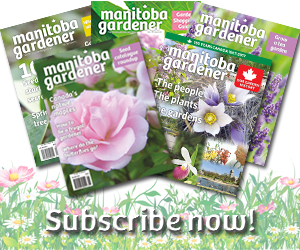 In an ideal urban Manitoba garden I would like to see beds of suitable perennials and annuals with prominent specimens of one or two trees and a few unifying shrubs. Taller trees would never be planted near the fence line or buildings. 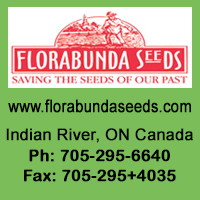 Woody plant maintenance is the largest undertaking gardeners make in their yards. Starting that effort off right through appropriate planting will produce a fine looking garden with much lower tree and shrub maintenance. 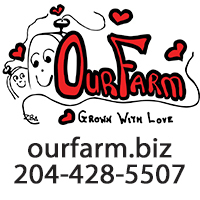 Mike Allen a consulting urban forester and consulting arborist, owns Vibernum Tree Experts.